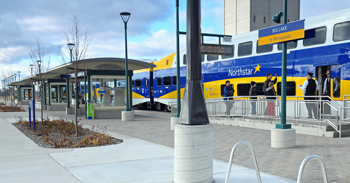 The Northstar Commuter Rail provides daily rider service in Central Minnesota between St. Cloud and Minneapolis. Central Minnesota’s population and economic growth warranted the need to explore additional transportation alternatives to accommodate the needs of commuters. District 3 conducted a Commuter Needs Study in 2012 to determine how best to improve the area’s public transit, park-and-rides, and car pool programs. The study includes an extensive inventory of existing services and programs. Public outreach was an integral part in gathering input; this included phone surveys, interviews, open houses and focus groups.